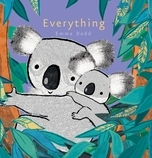 Parents love each and every thing about their child, as demonstrated by the charming mother and baby koala in Emma Dodd’s Everything. Featuring heartwarming illustrations embellished with foil, this cozy bedtime read is a handsome addition to any nursery bookshelf. What does a mother love most about her baby? Everything. Emma Dodd has created many books to critical acclaim. She works from a studio in Surrey, England. When not working, Emma and her family spend as much time as they can surfing and walking in all weather.